The Royal Welsh Show was the setting for the 2012 ASDA LambLink competition, which saw the very best Welsh lamb cooked before being judged by an expert panel. In a truly collaborative effort, Welsh lamb producers, who are suppliers to the ASDA LambLink scheme, provided the lamb, Welsh Country Foods processed the lamb and organised the competition, ASDA and Welsh Red Meat Promotion body Hybu Cig Cymru gave generous support, and the Royal Welsh show provided the venue. Welsh lamb leg steaks were the product which came under the spotlight, produced on farms supplying the ASDA LambLink scheme. Having been cooked, the steaks were tasted and scored by the panel led by celebrity chef, Dudley Newbery. The judges commented on the tenderness, taste and succulence of the Welsh lamb. Alun Davies (AM), the Welsh Deputy Minister for Agriculture, Food, Fisheries and European Programmes, presented the prizes. The Deputy Minister congratulated ASDA and Welsh Country Foods for their support in promoting Welsh lamb. He encouraged ASDA to further develop the marketing of Welsh lamb processed through Welsh Country Foods and stressed that the quality and integrity of Welsh lamb will deliver a fantastic product for its customers. His praise of the Welsh sheep industry, and the role it plays in the Welsh rural economy, was appreciated by the assembled crowd of farmers and industry leaders. Jim Viggars, head red meat trader for ASDA, was similarly impressed and full of praise for the Welsh farmers who are part of the ASDA LambLink scheme. Left to right - Prys Morgan, Welsh Country Foods, Dudley Newbury, celebrity chef, Gareth Rowlands, competition winner, Adrian Riches, ASDA Lamb Buyer, Alun Davies Deputy Minister for Agriculture, Food, Fisheries and European Programmes, and Gwyn Howells Chief Executive, Hybu Cig Cymru. The competition winners received prize money, which had been generously donated by ASDA. 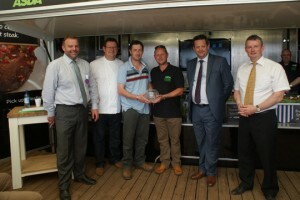 HCC (Meat Promotion Wales) also presented a cut glass rose bowl to Mr Gareth Rowlands, the winning producer. 1ST – G.Rowlands, Bryndernog, Llanddeusant, Anglesey. 2ND – W.G.Roberts, Cwrt, Aberdaron, Pwllheli, Gwynedd. 3RD – D.V.Bebb, Gelli, Llanfair Cereinion, Nr Welshpool, Powys.